ASHTABULA - Annie Been silently stood away from the house she lived in, watching smoke pour out of the windows and tongues of fire lick the ceiling. "I'm just in shock," she finally said. 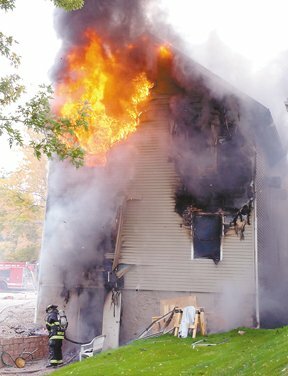 The three-apartment house at 1221 W. 6th St. was destroyed by a fire that started in the basement and quickly spread to the attic, Lt. Shawn Gruber of the Ashtabula Fire Department said. Damages are estimated at $60,000 property and $24,000 to $27,000 contents, according to the fire report. The report said the fire department received the alarm at 11:47 a.m. and was on the scene five minutes later. The fire was under control at 1:35 p.m., and the last units left at 5 p.m. Seventeen members of the Ashtabula Fire Department and five members of the Ashtabula Township Fire Department responded to the alarm. Gruber said some fire personnel had returned to the scene Thursday evening to take another look at the charred structure. No cause had been determined Thursday night. All people and animals living in the house escaped safely. Two firefighters received minor injuries, the report said. One sprained his knee and another received a cut on his thigh. Been came to the scene from work, but several of the building's residents were home. They said they heard a loud boom coming from the basement. "It was right under our apartment," said Wendy Melaragno. "It sounded like a dresser fell, a big dresser. Joe Baldwin, her fianc�, went to look downstairs and came back, saying, 'There's a fire! Get out!'" Judi Miller, Been's roommate, was also at home. A ring at her doorbell alerted her to the fire. "It wasn't your ordinary house fire because of the way it (the structure) was constructed," Gruber said. After the fire started in the basement, the report said, the flames quickly spread to the walls. The structure was "balloon construction," meaning the walls are hollow with nothing to stop a fire. Flames went through the roof and out the back windows while several spectators watched. Firefighters both went into the house and on top of the roof in ladder trucks to extinguish the blaze and ventilate the fire. Gruber said several layers of plywood, drywall and other wall coverings made it difficult for firefighters to penetrate the structure. The neighboring house, at 1227 W. 6th St., is about 10 feet away. Firefighters used water from a hose to prevent the fire from spreading there. According to a fire department report, the radiant heat melted the house's vinyl siding, causing about $5,000 in damages. Gruber said he had not yet heard of any smoke or water damages to the house Thursday evening. Owner of the apartments, Scott Lester, said the entire structure had been completely renovated about two years ago. The basement had a laundry room, storage space and hot water heaters and did not know of any problems, according to Lester. The structure was insured, but Lester was not sure what would be covered. "Everyone got out safely, and that's all that matters," Lester said. Gruber said the residents had been put in touch with Red Cross for temporary housing.